Within Teamwork Projects you can enable an integration for Instabug which allows for quick bug reporting. With this integration, all bugs and user feedback for your mobile apps can be converted into tasks easily. 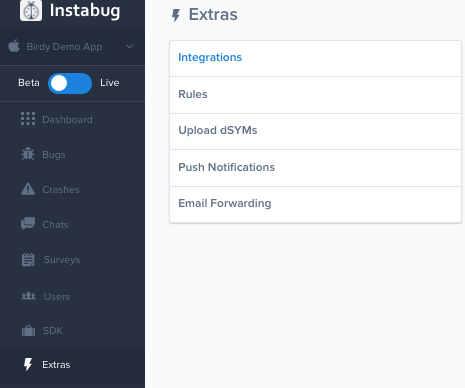 By integrating Instabug with Teamwork Projects, your team will have all the information needed to fix bugs pushed into a Teamwork Projects task without the need to go back to your users to ask for more information. To enable this integration you will have first have to locate your Teamwork Projects API key. Once you have located this, go to Instabugs Teamwork Projects integration page where you can login or create an account. Follow Instabugs on screen prompts to complete this. Token - This is your previously copied Projects API Key. Account URL - This is the URL you use to access your Teamwork site. Project - Which project you wish to log the bug to. Task List - Which task list within that project you will log the bug to. Assignee - Who on the project will work on the bug. Once this is completed you can view Instabugs 'How it works' for more information.